Question: How do I find quality time to spend with my husband who keeps very busy? Answer: If you can’t find quality time, create it. I can not emphasize enough the importance of quality time every couple should be spending with each other. Gary Chapman has named ‘quality time’ as one of the primary love languages. The quality time binds two people together as they get to know each other better and adjust better to each others’ needs, demands and wishes. phase of work overload for him. If there is no time i.e. he is actually a busy man, I would suggest that you create time for both of you. I think you should talk to him without sounding demanding. I know how it feels when our spouse prioritizes work over the partner. And it usually happens with women. They leave their career, home, friends etc for their husband and then husband gets immersed in his work. I also know how it will be almost impossible for you to ‘not sound demanding’ when you are actually demanding time from him. But sometimes demanding does not work that well. Talk to him slowly and with patience. 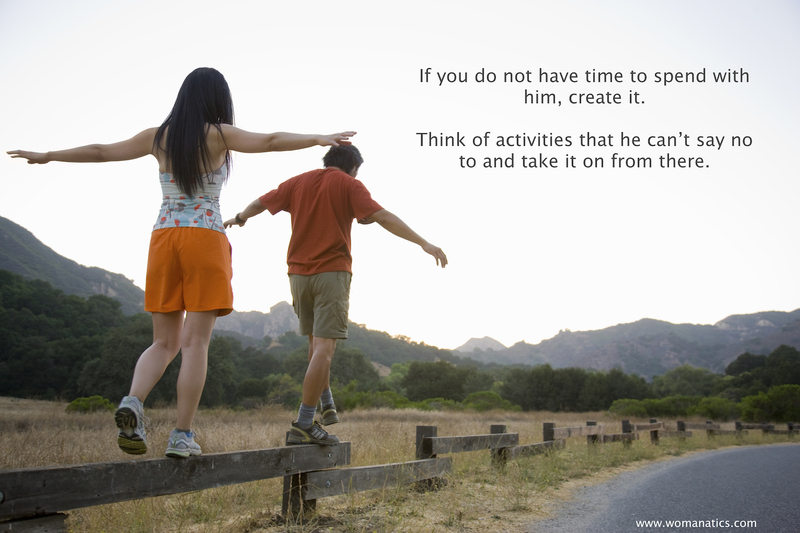 Do not start away with ‘I want to spend time with you.’ Start showing little interest in his work. For ex. one day you sit next to him and ask him what is it about his work that keeps him so busy. Given the workaholic he is, I am sure he would feel happy to talk about his work. If he tells you he has got a bad client this time or that this is just a matter of few days, you should give him a leeway else tell him that you want to know more about his work. Try to take interest in what he does. Ask him if you could help him. This would set the start of a conversation that was not there earlier. Then slowly you can take it forward by talking about his day at work, his colleagues and/or anything that interests him. Point is many a times the differences in interests of spouses is such that it causes a blank space between the two. You need to fill this space first and since he is not willing to do it, you do it by talking about what he wants to listen and talk about. Whatever time is left with you, after he is home, use it to create it as a time for both of you. I will do a detailed post on ‘how to create quality time with husband’ but in the meantime, take baby steps. Begin with talking to him about his work and then engage him in conversation and slowly pull him into talking to you. You can also suggest going out for activities that he enjoys so that there is a start of things and time that has both of you. If he comes home late, try your best to make him go to bed early so that he gets good sleep and wakes up early too. In this case, you two can spend time in the morning. Basically, create activities that he begins to participate in with you. Ask Womanatics: What to do if kundlis don’t match Ask Womanatics: In Love With a Married Man.. This kind of problem happens everywhere and every husband must think that they are not working only for them, but most importantly for their family. Only if the husband realizes/understands that its because of his wife's sacrifices that he is able to be such a "workaholic" and still manage to have healthy kids, clean home and good dinner, no problems would arise. This is the very common problem between husband and wife in this fast paced technology world. Couples always complain "No time for each other"
But if looked into this problem there will be many solutions. There are numerous ways for this problem. Some of them which I followed recently are listed below. 1) Morning time Husband will be busy reading news papers, getting ready and other stuff. Woman will be very busy cooking the food in a hurry. We can use the pleasant time in the mornings if both of them plan well. Like if woman instead of cooking everything in the morning from the scratch she can have some pre preparations done the previous day when the husband will be at office. Like preparing batter in advance so that breakfast will be instant. Cutting vegetables etc in advance and pack them in air tight container, so that she can prepare lunch within no time. So there will be some time available in the morning. She can utilize that time by preparing nice filter coffee or tea and enjoy with the husband sitting in lawn and can have pleasant mornings. 2) Husband mood goes down, when he sees his wife occupying in kitchen cooking dinner when he comes home after stressful work at office. So he looks out for other option like laptop, TV etc. Instead of burrying the time in the kitchen, if the wife prepares the dinner in advance before husband comes it would actually create some time. So that when he comes, if she can give him a warm welcome they can enjoy romantic dinner together. Husband mood also lifts when he sees his wife who is welcoming and have the dinner and everything setup ready.